By Melissa Lennig on May 10, 2017 23 Comments. This content contains affiliate links. As an Amazon Associate I earn from qualifying purchases. Inside: Most articles about teaching kids to ride a bike without training wheels go like this: Get your kid a balance bike. But balance bikes are expensive, and purchasing two bikes (a balance bike and a pedal bike) isn’t practical for most young families. 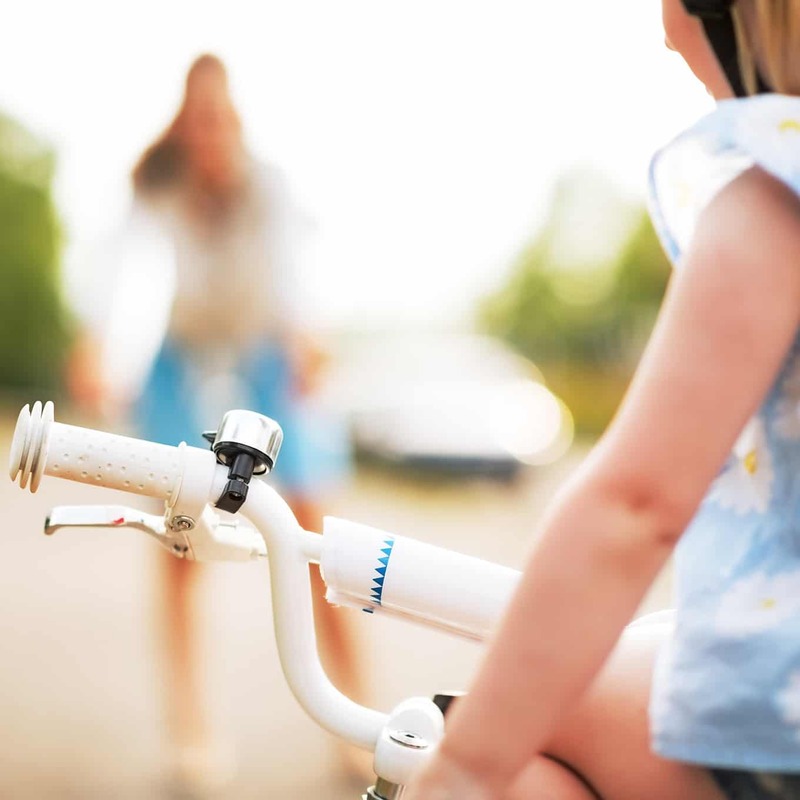 In this post, learn how I taught both of my kids—and several neighborhood kids—how to ride a bike without training wheels in under 30 minutes. We practiced again…and again. With the fear of falling no longer consuming him, his confidence grew with each length across the field. Within 30 minutes, he was cruising. I recently read a book called The Opposite of Worry: The Playful Parenting Approach to Childhood Anxieties and Fears by Lawrence Cohen. In his book, Cohen discusses the importance of validating a child’s fear without judgment. Validating my son’s fear of falling with calm assurance counteracted his anxiety and increased trust and confidence. Letting him know exactly what was going to happen (that he was going to fall) removed his fear of the unknown. Learning to ride a bike without training wheels is an amazing milestone. I was so proud of my son, I felt my heart might burst. Besides knowing he was emotionally and developmentally ready, there were several factors in place that contributed to his success. Follow the tips below, and you might have your kid riding within 30 minutes too! Helmets are essential, but knee and elbow pads can help increase confidence by making your child feel safe. My son wore “his armor” for two days, but only grabbed his helmet on the third day! I lowered my son’s seat as low as I could. This enabled him to place his feet comfortably to the ground, which made him feel better about riding without training wheels. Soft grass isn’t as intimidating or painful as pavement. 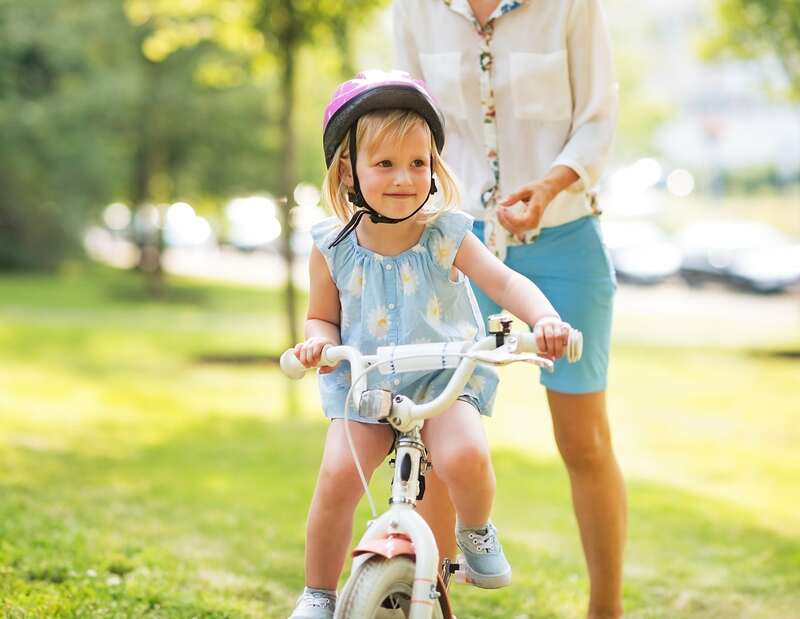 Encouraging your child to pedal down a small grassy slope can help him learn to balance his bike, naturally. 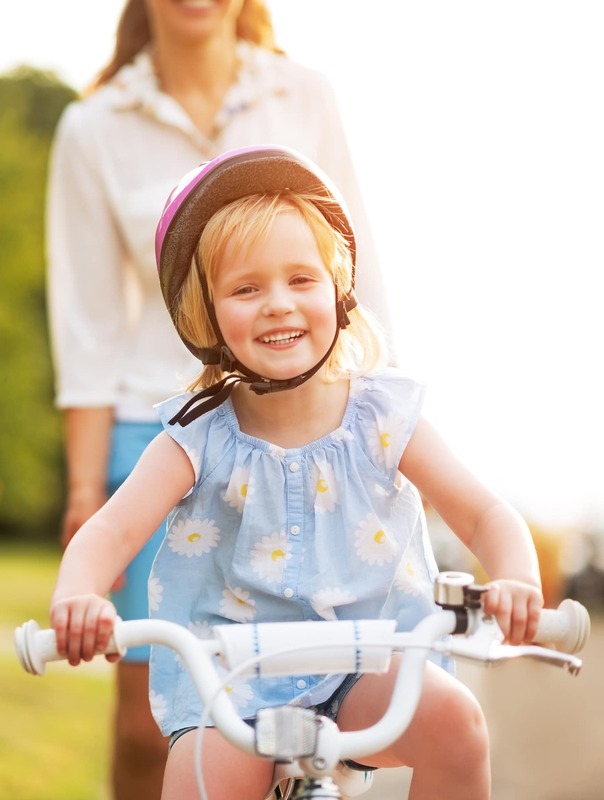 Holding onto your child’s bike the entire time hinders their natural ability to balance. I held my son’s bike steady as he climbed on and began to pedal, then gave him a gentle push forward and let go (I didn’t even run beside him). He fell often but quickly learned to balance his bike and ride independently. Once my son felt confident about his ability to bike on grass, I encouraged him to ride back and forth over the flat walkway. That little bit of concrete showed him that pavement was nothing to fear, and eventually, he felt brave enough to try riding in the parking lot. It would’ve been very easy for me to give up and give in, except, I know my kid! I know that this child, my oldest son, is the one who needs a little more encouragement to try new things. I made an effort to use a calm, encouraging voice that demonstrated confidence in his abilities! Cheer your heart out, dance, pump your arms, and spin your kid around in the air when he succeeds! However, nothing you can say or do will beat the feeling of success and pride your child is feeling intrinsically. How did you teach your child to ride a bike without training wheels? Share your tips below in the comments. 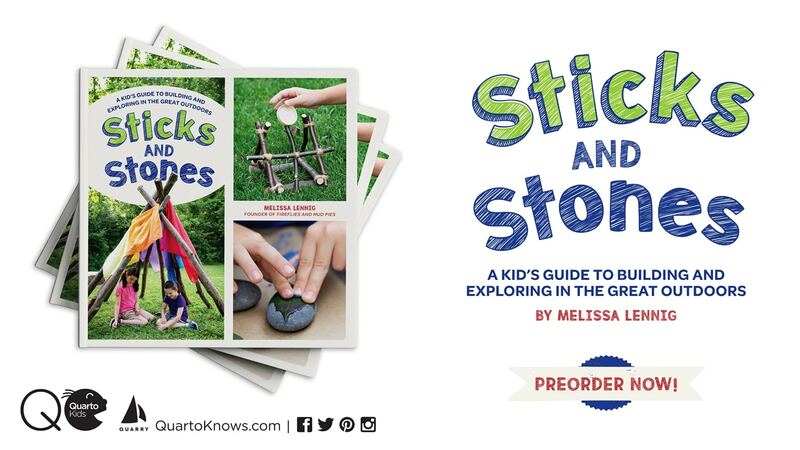 Oh, I am so very excited about this! My son just turned 7 and still refuses to take off the training wheels. We’re going to go get elbow and knee pads tomorrow! Thank you for such wonderful ideas and tips. I love the concept of learning to fall first and removing that source of fear. That is THE reason he doesn’t want to take them off. Aaaah! So excited! Training wheels helped me to learn. My parents lowered my seat and raised the training wherls. When I would start to fall they would catch me. Worked great! tried it today with my four year old: success within 5 minutes! I’m doing a happy dance over here with you! Yeah! Give your kiddo a high five for me! I know this is an older post but I’m glad I came across it. I have had alot of trouble trying to teach my son how to ride a bike. We started with training wheels and he had no problem on those. We eventually tried with out the training wheels. Things didn’t go so well. As soon as I would let go of his bike he would freak out because he had it stuck in his head that I let go so he was going to fall. And we had all the helmet and knee and elbow pads on. My son is 9 now and won’t even try to learn. I think I will give him a little push. It should be so easy now that he can touch the ground. I’m glad you stopped by to comment. Sounds like his fear of falling is getting in the way, so once you confront that, things should go much smoother! Good luck, Amy! My 8 yr old is kind of the same way mixed in also with he is afraid to bleed. He thinks he is going to bleed or get hurt.